Your critical vendor contracts should be in compliance with industry regulations and standards. Knowing some of the major elements that the regulators and auditors would most likely call out for deficiencies can help you take steps to properly address them. 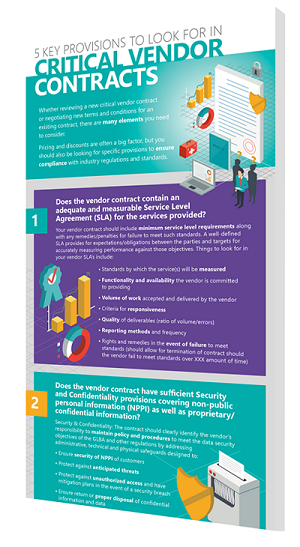 Whether reviewing a new critical vendor contract or negotiating new Terms and Conditions for an existing contract - our latest infographic can help.